Earlier this month, GE Transportation, a division of General Electric, along with California’s Port of Long Beach, announced a pilot initiative to collect broader amounts of information related to inbound ocean container shipments. Supply Chain Matters recently had the opportunity to speak directly with Jennifer Schopfer, Vice President and General Manager of Transport Logistics for GE Transportation regarding this latest announcement as-well as the broader directions involved in this effort. The Port of Long Beach effort is a follow-on to a described successful pilot with the Port of Los Angeles, one of the nation’s busiest ports, that occurred in the late 2016 and early 2017-time period. The overall goal of these pilot efforts, according to Schopfer, is the ability to improve cargo flow as well as to provide key stakeholders much broader, and far more timely container shipment planning and visibility information to improve efficiency and customer service. This includes the ability to increase visibility of incoming cargo from two days to two weeks. The effort includes connecting transportation data from rail networks, intermodal terminals and ports into a single transportation management workflow managed by GE’s Port Optimizer® Cloud based software offering. The basic objective is to provide an information portal of key aggregated information of expected resource activity needs within the port, days ahead of expected arrival, facilitating movement visibility with added information related to routes, container pickups, truck chassis availability, documents, and payments. 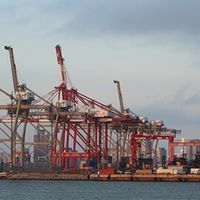 The new pilot for the Port of Long Beach is expected to launch in July and includes implementation of the Port Optimizer application at marine terminals that include Total Terminals International and Long Beach Container Terminal during the 2-3-month pilot period. Meanwhile the Port of Los Angeles pilot is scheduled to move toward go-live status in July as-well. Schopfer indicates GE Transportation has been aggressively investing in the Port Optimizer application as well as fielding initial interest among at least 10 other well-known domestic and global port facilities. Earlier this month, GE Transportation and project44 announced the planned integration of project44’s SaaS platform to augment GE Transportation’s Railroad and Shipper product suites. She openly indicated that one technology provider may not be able to provide broad global capability and declared GE Transportation’s openness to partnering with other existing transportation and logistics platforms to achieve the goal of one common, open platform of enhanced end-to-end visibility. As Supply Chain Matters has observed in previous commentaries related to supply chain business network or logistics platforms, the key to long-term success rests with who ultimately pays for the services, and who benefits from the services. Schopfer indicated that at this point, the effort is being positioned as a broader stakeholder benefit application with individual Port Authorities assisting in the initial funding of these pilots to provide demonstrated benefits for shipping and logistics stakeholders. This is described as a “technology start-up approach”. Plans going forward call for a subscription-based funding model that aligns to specific stakeholder partner value achieved in added efficiencies, improved and more responsive service levels among logistics and services entities. One our 2018 Predictions for Industry and Global Supply Chains calls for 2018 being a year that features physical or virtual scaling of logistics and fulfillment networks among multi-industry sectors, accomplished by either significant money flows or technology platform investments. We view the ongoing technology deployment efforts by GE Transportation to build added shipper, end customer and stakeholder value among all the logistics entities involved in ocean transportation and corresponding intermodal logistics movements as a demonstration of such technology platform investment. If a broader grouping of ports, stakeholders and end-to-end transportation platform providers collaborate and come together in such efforts, than there is a consideration for achieving scale, broader value and added efficiencies for all stakeholders that eventually adds value for multi-industry supply chain and line-of-business teams.